Ok so after Germany came in January 2018, made some noise in media and in the company and network, we saw some official statement from Onecoin that Germany Nürnberg-Fürth court found nothing illegal in Onelife or Onecoin business plan and also they found a blockchain. But those were only claims from the Onecoin company and we could believe them or not. I never made a topic about this cause I asked them about it and I was told that Onecoin was never client of Marc Scot and Konstantin did not care about this case. Well, he did fly to USA knowing about this case and what it is about. Looks confident, one would say. Now we can see that Onecoin working in the USA in 2014-2015 did go against the law. Ruja Ignatova was charged for $1 billion that leaders allegedly took from "investors" and she needs to return it. This indictment is to charge Ruja of running a scheme that took money from USA citizens and transferred it oversees and you can not do it without SEC. That is why most ICOs are not accepting USA investors and probably Ruja realized it and stopped accepting people in 2016. It would be a good time for her to come and say something. Otherwise, she is guilty. Basically, here we see all the same old stuff with the addition of some new evidence that made some of us fulls and useful idiots. Here we can see allegations about a fraudulent crypto coin that has no blockchain and is ponzi pyramid scheme (but on the other side we saw one german and more EU investigations say it is legit mlm...). As the introductory phrase signifies, the entirety of the texts of the Complaint and Indictment constitute only allegations, and every fact described herein should be treated as an allegation. OneCoin Ltd.’s private blockchain may be contrasted with Bitcoin’s blockchain, which is decentralized and public. But what is new are some disturbing email conversations between Ruja and Sebastian that was concealed and named founder2 as we know he was already sent to USA by Thailand. We need to admit that people who fanatically attacked onecoin for that first blockchain were right, this did start on the wrong foot. But what I see today is something that community is driving and want to finish so I personally hope Onecoin will not die dispite Ruja or who ever authorities lock up and prove guilty are gone. Bitcoin lives without satoshi after all. That is, if they manage to prove that there is a coin and a blockchain and if authorities do not start baning onecoin. I will leave this topic for people to comment and be free to post pictures from the doc cause I do not have energy to do it, in case you missed, I went away from crypto space last few months cause it is all dead. Also, I would thank BehindMLM for putting me with all those early people who were here before me, I deserved it. But I would ask to be objective and not make me responsible for content people write here. It is a free opinion forum, and also I was always stating my opinions like a community member. And I will, as I always said, admit my mistake and apologize to people I might have offended in the fire of arguments. I could shut this down a long time ago and stop mudding my name but I just wanted to help people who were already involved with info that they can not get cause their uplines abandoned them. And since there was no official documents that say Onecoin and Onelife are illegal, there was no reason to stop. Now, however, at least for me, story changes. I am a bit dissapointed to be honest. But I say let's wait and see how the company will defend. Ignatov is being represented by a team led by Schertler & Onorato senior counsel Robert Bennett. He, too, did not respond immediately to a request for comment. It is known so far that Konstantin had his hearing in California on time but without the presence of a lawyer but seems like the transcript is not available to the public. 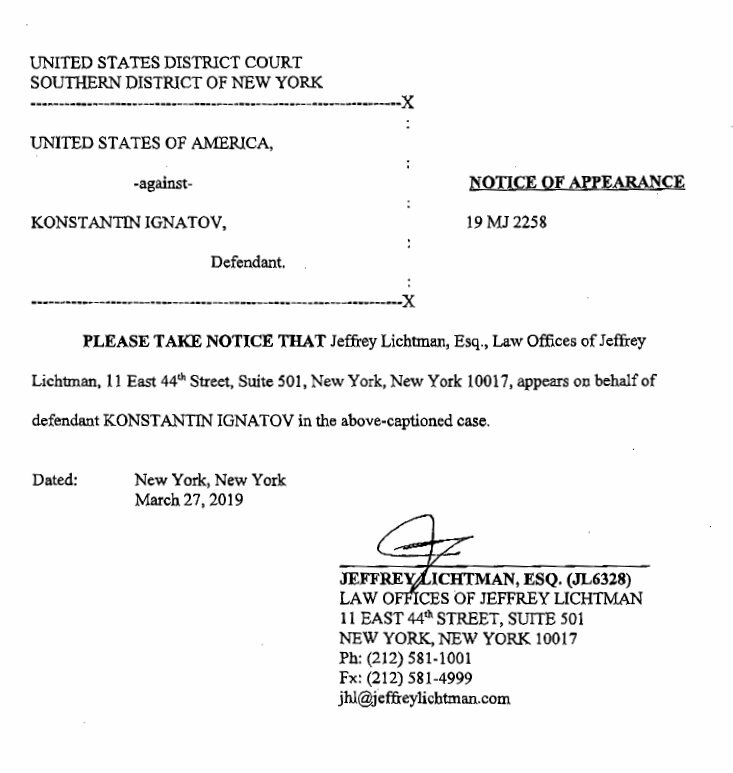 Since New York state is the one that deals with financial stuff, it is natural that their department of justice is trying to build the case so Konstantin was moved to New York and will soon have another hearing but with the presence of lawyers. Date of hearing is unknown but should not be more than 2 weeks. Konstantin Ignatov's first hearing is set to April 26th. Konstantin Ignatov will be defended by Jeffrey Lichtman, a famous lawyer who has previously defended likes of Mafia mobster James Gotti Jr, and the Mexican Sinaloa Cartel drug lord Joaquín Guzmán better known as El Chapo. Could there be any reason why this article about Konstantin ignatova's arrest doesn't show up when you try searching for it through www.justice.gov ? Or is there something else we don't know? Thanks Igor. I have been mostly a passive member but been reading here for a weekly basis. Could be the search indexing hasn't been done yet, or that search doesn't for some reason show the United States Attourney's office Southern District of New York press releases. Well I look at this my way. We could all anticipate this would be the truth, our friends, critics did buzz that it was started back in 2014 as a scam. But most of us here joined during new blockchain and I personally did fight all those bad IMA who were doing aggressively and promising. Even if this did start with trash blockchain but was not using it properly or did not use it at all, we still do not know for the fact if even today coin is fake. We need to wait for that proof. And if that is the case, then it is fine, just lock them and charge a fee for bad intentions and deceits, and let the new people bring this project to life, cause, sorry, but that is all I see. People who want to make coin usable and they all believe coin is real. Although we really have no proof of that other than a belief and that is very wrong for crypto...I hope this will get on better. I do not understand people who say "onecoin is dead". They were saying that in January 2018 too. It will not die unless authorities deem it illegal or they pull the plug like Bitconnect. Stay tuned. Respectfully, if you read the emails, this is not only about blockchain, it's just a technical part of the whole scheme. The main issue is the project was planned to be a scam, and that created an unhealthy ecosystem, which in my opinion has zero chance to function after the USA investigation news, and Ruja-Sebastian emails revealing OneCoin was planned to be a scam. Who in the right mind would buy coins from merchants after the USA news? MLM sales were going down for 2 years anyway, and for sure there's practically no chance for non-MLM sales after this. Who would give a license to an exchange, considering the founders have been found to make clear in emails that OneCoin is a planned scam..
We could say that, I can agree that it might not start healthy, you warned about it, we did not believe in your opinions cause none of us had proofs. Now we have and we need to be on the same side when it comes to the start. But that is not my point, they did not pull the plug last year January, I hope they will not now. Meaning old "scammers" left, let the law case them, but new people overtook and will make it happen. Let's compare it to Bitcoin. Pricewise and also user-wise, it was pumped in q4 2017 and then someone took all the money and went leaving whole crypto space in ruins. Let's say satoshi did it? With the help of exchanges that we now have proofs have fake illegal activity. Where is Bitcoin and crypto space now? Those who were honest in the scam times will take over, regroup and continue. I truly hope that will happen with Onecoin community too. Cause if they survived 100% of their worst days so far, they need to keep on going. And I mean merchant wise and when dealshaker and exchange launches. I say this for the sake of all the members who have a stake in this project (coins). My goal in GLG was to educate them about the rest of cryptos and to show them how onecoin vision is different its pros and cons. That means I am well positioned in other coins as a masternode staker something will work out for me but those people who did not bother to learn outside need this to work. Not to die. If you critics are honest, you need to save also people who are involved, not just possible new people. My opinion. That said, no one will ask you to help. But do not do damage. Be honest and objective. Here is the true reason of this investigation ! To protect Wall Street’s markets. So Mr Vance claims that OneCoin is dangerous because it compromises the integrity of New York’s financial system. If OneCoin was a scam, would it compromise the integrity of New York’s financial system ? Damn not ! Thanks for letting me post again. I appreciate that. Lets try to keep this discussion civil and informative without unnecessary provokations. If there will be any posts with personal attacks or strong provocations, I hope you can moderate. So this logic of yours exceeds the facts that Ruja and Sebastian planned OneCoin to be a scam in acquired emails Sebastian provided, and Ruja even planned an exit-strategy: Direct quote of Ruja "Take the money and run and blame someone else for this.."
Respectfully, I think your logic here is flawed. The above section can be found on page 8 of that report. Last edited by CryptoXpose on Sat Mar 09, 2019 1:36 pm, edited 2 times in total.